We often pass this river level marker on a bridge. I'd wondered if Leopold was the same one as the scope and optics manufacturer. It turns out that Leopold started as a company that repaired surveying equipment, Stevens contracted with them to manufacture a water level indicator he had designed, and only much later did they start doing scopes. 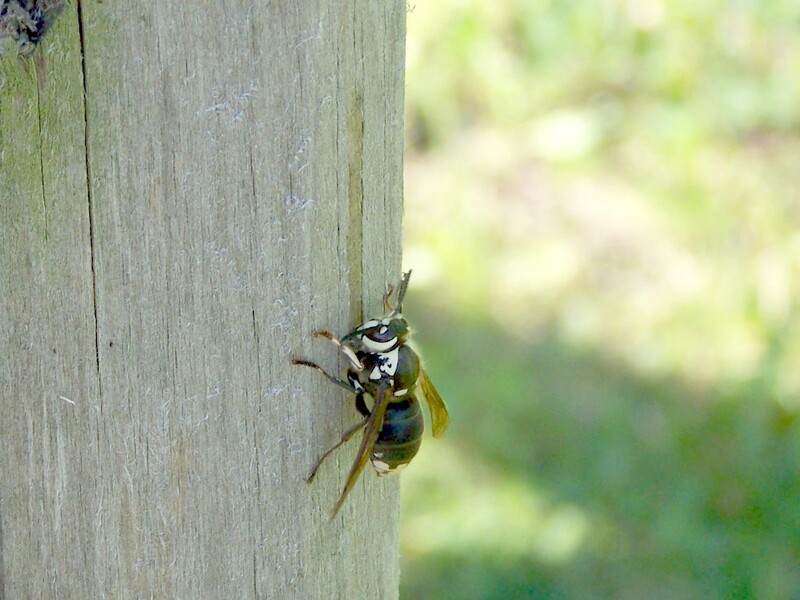 While waiting for Bella to catch up, saw this hornet-like bug cutting a groove in a wooden fence post. And in other news, allergies somehow made me lose my good glasses, the only pair of bifocals I own. My eyes have been getting abnormally itchy at night, and I wound up going to sleep on my recliner relatively early, not so much because I was tired, but because my eyes felt better closed. Oralia woke me to go to bed. In the morning when I got up, my glasses were not in their usual spot by my bed, and even with a spare pare, they are not in any logical place I can think of--I've searched all around my bed, my desk, the bathroom, the kitchen and the recliner (even inside the recliner) and come up empty. It took a couple weeks to get used to my bifocals, but now I miss them, I'm back to taking my glasses off for close work. Dave--search the recliner for your glasses. I lost my expensive poarized and bifocaled sunglasses once, and found them years later in the recliner when I was moving it.